Ed note: Here we go again, another “fiercely pro-Israeli” non-elected “offical” is called in as “special envoy” this time for Venezuela. Is there something about being fiercely pro-Israeli as a qualification for being appointed as a special envoy for Venezuela tapped by the Christian-Zionist Mike Pompeo? The best place to start unraveling that mess would be to understand Mike Pompeo is a Christian who is “tapped” into the bible in a huge way. Pompeo is acting as a proxy for Neocon interests controlling US foreign policy. Although Israel has no official diplomatic ties with Venezuela, the US asked Israel to recognize Venezuelan opposition leader Juan Guaidó. Israel has every motivation known to support the opposition in Venezuela. If the government of Resident Maduro collapses it will provide Israel easier access to cocaine moving out of the region. Elliot Abrams wrote a book called “Faith or Fear: How Jews Can Survive in a Christian America” claiming “Jewry can only survive as a religious community in America”. This is the age old technique of maintaining “fear” in the minds of Jews about Christians. Organized Jewry has captured Christians in America converting them to Zionist-Christians under John Hagee’s operation working with elements inside the Israeli Knesset. Mike Pompeo operates inside this network. If you disagree with Neocon policies you become immediately targeted for the irrational accusation of being “antisemitic”. This is exactly what Elliot Abrams accused Chuck Hagel of when Hagel was head of the Department of Defense (DoD). The continued irrational accusation of being “antisemitic” neutralizes all opposition to Israel as Israel becomes the dominant regional power. Years ago, Elliott Abrams was the former top Bush administration official in charge of Israeli-Palestinian issues. Elliot knows how the IMF works and how it entangles countries into debt. He republished some of his recommendations and case studies on his blog about an IMF report on Palestine that appeared at the website for the CFR on May 20, 2015. Why is this significant? Because Juan Guaidó the right-wing opposition leader that the US is trying to illegally install as Venezuela’s president, was immediately instructed by his handlers to set his sights on Venezuela’s state-owned oil company. Venezuela has the world’s largest known oil deposits with an estimated 300,878 million barrels of proven reserves. US oil cartels want easy access to those reserves. Juan Guaidó’s handlers have instructed him to begin to move towards privatization of the state-owned oil company Petróleos de Venezuela, S.A. (PDVSA). Guaidó is also seeking money from the criminal International Monetary Fund (IMF) to fund his non-elected government and this is why Elliot Abrams was “tapped”. The Council on Foreign Relations and the International Monetary Fund have a very close working relationship. Corporate elites within the Council on Foreign Relations (CFR) establish the framework for the IMF operating in different countries. The IMF often gives briefings at the Council on Foreign Relations on international economics and banking. 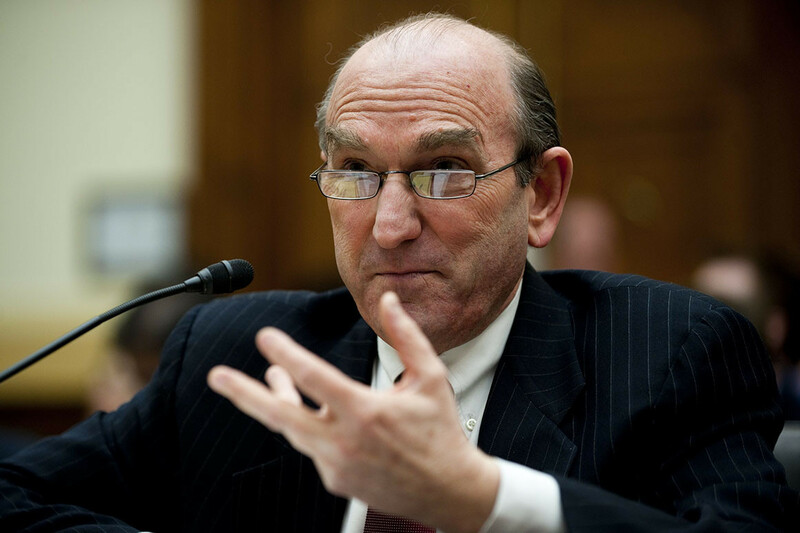 Elliot Abrams is a militarist with a long history inside the Neocon network running through the think tanks he is associated with, the CFR and the IMF. It is an ominous indicator war is coming when Elliot Abrams is placed in the position he has now been placed in allegedly by Mike Pompeo. Elliot Abrams has been tasked to set up the problem then provide the solution. Please go to Politico to read the entire article. Ed note: If the Venezuelans mistakenly get rid of Nicolás Maduro, they will become serfs under the IMF and the bolívar will be removed and replaced with the US dollar. If the Venezuelans stand with Juan Guaidó the country’s economy will be dollarized. If this happens the country of Venezuela will be overrun with Colombians, Brazilians and anyone else in South America turning the continent into a US slave plantation so that big US corporations and oil can go into Venezuela to take whatever they want. Number one thing on Guaidó’s “list of sh*t to do” then, was try to replace Citgo’s executives so that the US can reestablish control of Citgo. Headquartered in the Energy Corridor area of Houston, Texas, it is majority-owned by PDVSA, the state-owned company of the Venezuelan government. The second thing that just happened was to appoint special envoy Elliot Abrams from the CFR to restructure Citgo under the IMF to return control of Citgo to the US. This is related to an alleged violation of the terms of a multi-million dollar agreement with Canadian mining company Crystallex International Corp. Despite what Americans are being told about how incompetent President Nicolás Maduro of Venezuela is, or how corrupt his government is and how Maduro has caused out of control inflation in Venezuela, what the media isn’t telling people is that billions of dollars in Venezuelan assets have been taken over by the US. The Bank of England refuses to turn over Venezuelan gold the BoE is holding under contract for Venezuela. Juan Guaidó then announces not to return the gold to the government of President Nicolás Maduro. Juan Requesens presented a bit of an image problem so he was replaced with Juan Guaidó. Juan Requesens was arrested in August, 2018 when he was involved in a drone assassination attack on President Maduro. MEXICO CITY/CARACAS (Reuters) – Venezuela’s most important foreign asset, its $10 billion U.S. refining arm Citgo Petroleum, is hunkering down to arm itself with a legal strategy to block efforts for its board to be removed and its revenues diverted to an opposition government, sources close to the talks said. But President Nicolas Maduro said in Caracas on Friday that his government would seek to defend the refiner, raising the prospect that Citgo, run by Maduro appointees, could become a battleground between the two claimants to the leadership of Venezuela. Citgo is a wholly-owned subsidiary of Petroleos de Venezuela, or PDVSA, but it has not been able to send its revenues, in the form of dividends, to Venezuela due to U.S. sanctions. Please go to Gray Zone﻿ to read the entire article. Marco Rubio is on the Senate Intelligence Committee and as such, it is important to understand where Rubio may be receiving his intelligence from, the quality and integrity of that intelligence. As such he is fast becoming an “enemy of the American people” as events rapidly spiral out of control in Venezuela. Since when does a sitting US Senator contact the military of a foreign nation to encourage sedition and insurrection? Listen to Rubio…it is frightening to understand just how incorrect Rubio really is in his statements on a number of issues. Maybe Marco Rubio can explain this image and a lot more that are being faked? Give it up Marco Rubio, the American people have now expressed they have no trust in the media and this image is a good reason why.